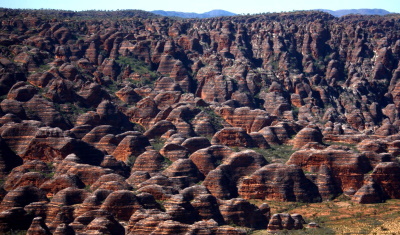 Purnululu National Park is famous for the sandstone domes, unusual and visually striking with their striping in alternating orange and grey bands. The banding of the domes is due to differences in clay content and porosity of the sandstone layers: the orange bands consist of oxidised iron compounds in layers that dry out too quickly for cyanobacteria to multiply; the grey bands are composed of cyanobacteria growing on the surface of layers of sandstone where moisture accumulates. I took the more comfortable route to this site by flying in a small aircraft from Kununurra to Bellburn Airfield, within the Purnululu National Park. This had the added advantage of seeing the extent of the Bungle-Bungles from the air. From the airfield it was a short drive to the Cathedral Gorge, in the centre of the park and in the midst of dozens of the colourful beehive domes. Took a hike into Cathedral Gorge, noted for its shade, and ever-changing colours. Visited one of the camps for overnight stays, but opted to return to Kununurra. The Bungle-Bungles were awesome, from the ground and the air as well! Definitely worth the bumpy -- really bumpy -- dirt road access into the park. And, be sure to spend a night in the park at one of the campgrounds to get the full effect of the wilderness. Paleozoic: The sandstone formation of the Bungle Bungle ranges is estimated to be 350 million years old, give or take a few millions. 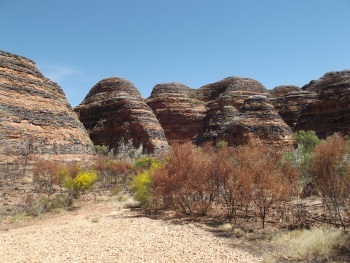 Like the reefs at the Geikie and Windjana gorges the range was formed during the Devonian period. Recently discovered: "Clear is that the range, though only 100 km from the main highway, was only "discovered" by a film team in 1983." Locals knew about it of course.